Toone is another small cafe back a narrow impasse and mostly visited by locals. It's at 6 Impasse Schuddevelde, which is back through a doorway at 21 Petite Rue des Bouchers. The Toone cafe is connected to the Royal Toone Puppet Theatre. There are a number of small rooms, some of which may be in use for a private party or for a small puppet show. The main puppet theatre is upstairs. 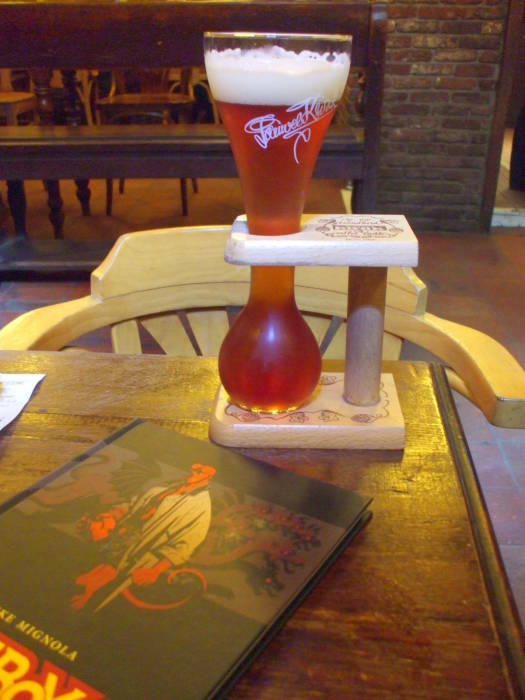 Among other choices, Toone has Pauwel Kwak au fût or on draught. This being Belgium, it of course comes in its special glassware. And this being Kwak, the odd glass (shaped like a bicycle horn) and its wooden holder look like refugees from a chemistry lab. 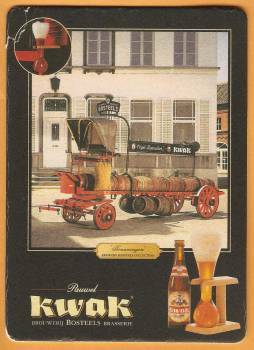 The company's marketing department claims that innkeeper Pauwel Kwak invented the glass in the early 1800s for coachmen. But the reality is that the beer and its glass were developed in the 1980s. 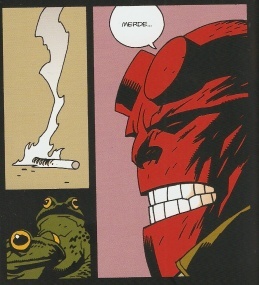 This being Belgium, the home of comic book mania, and besides, the bar being named Toone, I thought this would be an appropriate place to read Hellboy in the original French. 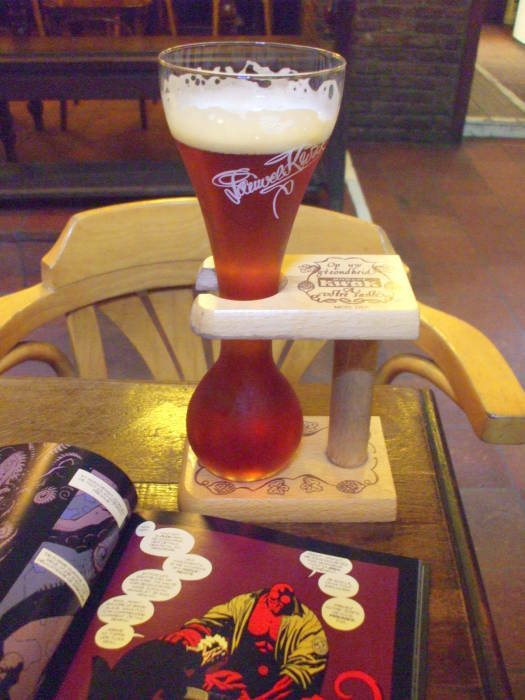 There is nothing unusual about sitting in a Belgian cafe while reading a graphic novel and drinking beer from strange glassware. Really, you fit right in. For more on Belgium and comics, see my page on that.